← Throw a log on the fire. Plays in the Park – Ninesprings, Yeovil. Well, today was the day – and the rain Gods did their worst, not only that, a competing air display sent clattering helicopters overhead. 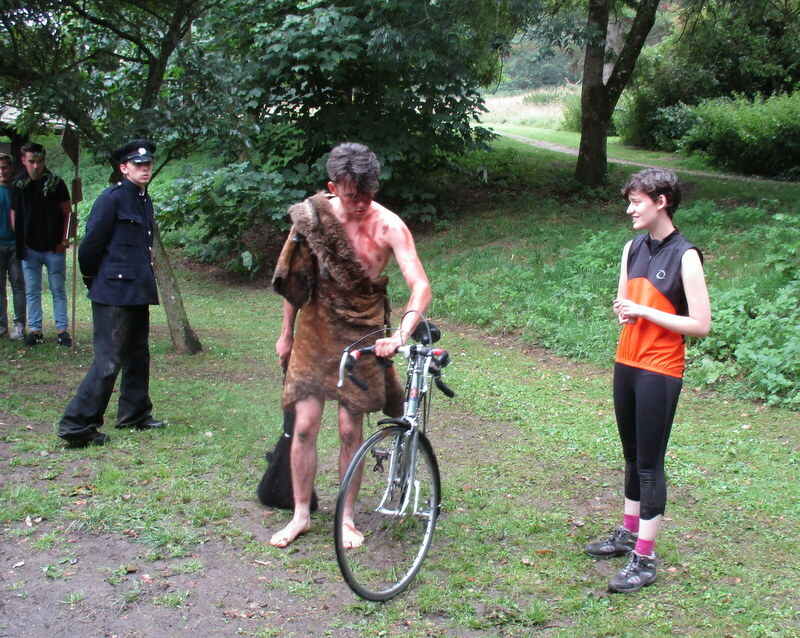 Lives Pass By – my play in which a Bronze Age Man, a Victorian Railway Inspector and Today’s Young Cyclist meet in the park. But the show must go on and the Yeovil drama students, and all concerned behind the scenes, kept the show going performing eight, quarter hour plays around Ninesprings Park, with a morning and afternoon performance. And a very good job they did in spite of the distractions. It was a fair hike for the audience, too, from play location to location, up hill and down dale through the Park woodland. I think it is fair to say the company and the audience enjoyed the day. And particular thanks to Nick White who produced, directed and conceived the peripatetic performance.